Recently, much of my time has been spent transcribing audio recordings collected from interviews and focus group discussions that I’ve conducted during my data collection phase. Transcription isn’t as straightforward as it might first appear and that’s evidenced in theory-heavy literature. Avoiding the theory for the purpose of this article, I will run through my process and pitfalls of transcription. Most of the interviews and focus group discussions were conducted in English, although interspersions in local languages such as Yoruba and Nigerian Pidgin were common. I use footnotes to provide literal and contextual meanings of these phrases, and separate them in the transcribed text by use of italics, “quotation marks”, ‘inverted commas’ or a different font colour. Interviews conducted in languages other than English are transcribed in the original language and translated. To begin the process, I load my audio into the transcription software Express Scribe. The software allows for transcription through voice recognition, however this wouldn’t work with the nuances and accents of non-native English speakers so I avoid that function. I type directly into the software, and handily it automatically saves the typed work. After I create a first draft using the provided writing software, I copy this into a Microsoft Word document. Its editing capabilities are much more advanced so I go through the highlighted spelling errors here. I insert detailed information about the respondents, a reflective commentary on the activity, links to associated materials and a summary of the transcription interview. I also include line numbering for easy referencing. The first draft is edited initially using the spellcheck, then I start the formatting by placing the interviewer’s statements and questions in bold italics. I then denote the translations of non-English words and statements as described above. Then would begin the final proof-reading which personally I find to be the most challenging part of the process. I listen to the audio data again, paying close attention to the details. 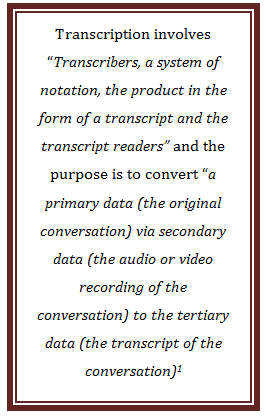 This is to make sure the written transcript accurately reflected both the content and the meaning of the audio data. A lot of rewinding, forwarding, pausing, deleting, adding, correcting, punctuating etc. occurred at this stage. Finally, I skim over the entire document to ensure that the page alignment, numbering, highlighted text and footnotes are in order. The finished transcript is then uploaded to the DirtPol archive. The act of transcription is interesting but time consuming; it easily becomes tedious and uncomfortable due to sitting down at a computer for extended periods. It’s therefore important to use comfortable working equipment, including using seat, desk, keyboard adjustments as well as suitable headphones. For me, the major challenges were low quality audio due to background noise or the respondent(s) being too far from the microphone and the complexity of shared meanings or contexts. To overcome this, I sought assistance online and informally to ensure correct translation of meanings in local languages. I also needed to ensure I was doing the transcribing in a quiet environment in which I could fully concentrate. As the aim of transcription is accuracy and reliability, factors that could jeopardise this must be dealt with before, during and after the act of transcription. About the author: Jane Nebe is a project researcher on the DirtPol project and is concerned primarily with issues pertaining to dirt in education and schools. 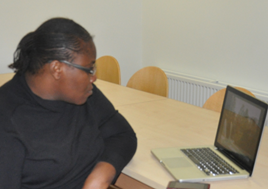 Jane is based in Lagos, her academic background is in pedagogy and　she　speaks Igbo, Yoruba, Nigerian Pidgin and English. About the project: DirtPol is an international cultural studies project based at the University of Sussex. For more information please visit the DirtPol website. Kowal, S. and O’Connel, D. C. (2004) Analysis, Interpretation and Presentation: The Transcription of Conversations in U. Flick, E. Von Kardoff and I. Steinke (eds), A companion to Qualitative Research, London: Sage Publications, pp. 248 -252.